Yesh Atid chief blasts Joint List party, calls MK Zoabi and former MK Ghattas 'haters of Israel'. 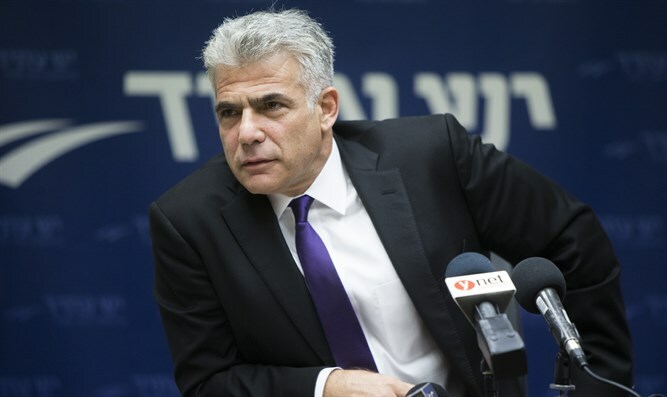 Yesh Atid party chairman and former Finance Minister Yair Lapid laid out his plans for cobbling together a coalition government after the next Knesset election, saying who would – and who would not be welcome in a Lapid government. Bolstered by recent polls showing his Yesh Atid party leading or effectively tied with the ruling Likud party, Lapid has claimed he would be a viable candidate for the premiership, despite the difficulty entailed in constructing a 61-seat majority coalition around his center-left party. While the latest Knesset poll, released by the Panels polling agency last Friday, showed Yesh Atid leading Likud with 28 mandates to 25, the party’s currently included in Netanyahu’s coalition still maintained a 64 seat majority. In 2009, Tzipi Livni headed the Kadima party that received one more Knesset seat than the LIkud with Netanyahu at its helm, but, unable to form a coalition, she conceded the premiership to Netanyahu. Speaking with 101.5FM on Sunday, Lapid described what a future Yesh Atid-led coalition would look like. Lapid also explicitly ruled out inclusion of the predominantly Arab Joint List party. Recently, Joint List MK Basel Ghattas was forced to retire from the Knesset as part of a plea bargain agreement after it was discovered that he had provided jailed Hamas terrorists with banned cellular devices and smuggled messages into and out of prison on their behalf. MK Zoabi has faced criminal charges for assaulting a police officer and her involvement in pro-Hamas attempts to run Israel’s security blockade of the Gaza Strip. Without the Joint List and its 13 mandates, Lapid could find the task of cobbling together a 61-seat coalition daunting. Even according to the recent Panels poll, which shows Yesh Atid receiving a remarkable 28 seats, without the Joint List, Lapid would have to bring in not only the centrist Kulanu party, the left-wing Labor party, and the far-left Meretz faction, but also tempt at least one haredi party and Defense Minister Avigdor Liberman’s Yisrael Beytenu to nominate him over Prime Minister Netanyahu. Lapid, who initiated the drive for the haredi draft law in 2013, earning the ire of the Shas and United Torah Judaism parties, would be unlikely to convince either to back him in forming a government. Earlier this year, Shas chief Aryeh Deri expressed his support for Netanyahu as Prime Minister.